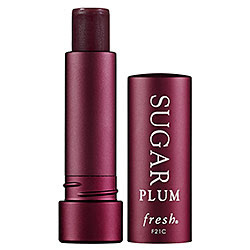 One of my favorite lip balms, Fresh Sugar Lip Treatment, is now available in Plum and of course I just ordered it because I am absolutely obsessed with all things plum. It's a bit pricy at $22.50, but it's a worthwhile luxury to me. I also have the Rose and Clear and have repurchased several times. And good Lord, don't forget to go thru ebates.... 4% back. Disclosure: This post contains an ebates referral link. I love that deep purple plum color, so pretty!